About a third of the way into The International, some blah blah exposition occurs where we learn this whole picture is about an international bank trying to broker an arms deal into the Middle East. At this point, I decided "this doesn't concern me. I don't care." But there was still 90 minutes to go. The International lives up to its billing with some sweet location shots of Berlin, Luxemburg, Istanbul, and New York. 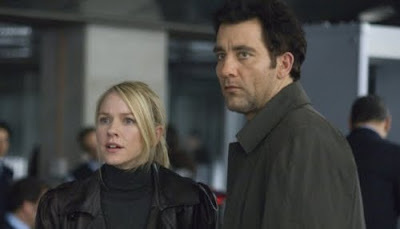 Clive Owen plays a blood-stained Interpol agent trying to bring down the bank with his glower power. Almost as an apology to the audience for all the thin-lipped European men making secret deals in gun metal grey offices, The International stages a wildly bloody shoot-em-up sequence in the Guggenheim where the blood flows out of wounded men like geysers. The only thing almost as out of control as the squibs was all the philosophizing in the screenplay. Every character had some hackeyed code of living they would drop to each other like: "When there's no way out, the best thing to do is go deeper", "Sometimes we find our destiny on the road we take to avoid it," and "In life you have to know which bridge to cross and which bridge to burn." There were at least a half dozen more fortune cookies like those. I might have been able to pay more attention to the complex plot ripe with betrayal but every time Naomi Watts was on the screen, I was mesmerized by her lustrous blonde hair, pulled tightly in a pony tail but with the bangs on the left side framing her face just so. Stunning, stunning hair. I wanted to bathe in it. I'll bet her hair had its own animatics in pre-viz.